Cesária Évora: The Barefoot Diva Who Paved Her Own Path Évora, known as the "barefoot diva," helped bring morna beyond Cape Verde and into the international world of music. With her 1995 album, Cesária, Évora placed her definitive stamp on the style. 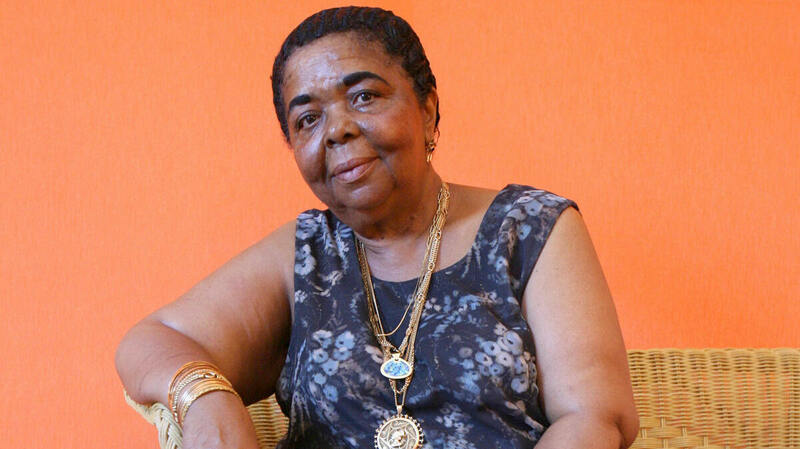 Singer Cesária Évora lifted Cape Verde's little-known blues, morna, beyond the island and into the international world of music. If there were ever a voice that embodied that of a siren, a voice that could seduce, sadden and soothe with its elegance, it was Cesária Évora's. It was the voice that lifted Cape Verde's little-known blues, morna, beyond the island and into the international world of music. In 1995, Évora's years of living and singing the blues culminated in Cesária, an album that cemented the importance of Évora, and morna, in world music. As with the greatest blues singers of all time, the knowing and sensitivity Évora brought to morna was lived, not sought after. She was born in Mindelo, a port city on the island of São Vicente. Her musician father died when she was a young girl; Évora's mother, unable to care for her, placed her in an orphanage soon after. By the age of 16, Évora was already world-weary: swigging scotch, burning through cigarettes and captivating patrons with songs of loss in tiny Cape Verde taverns. She sang in Kriolu, which draws from West African dialects and Portuguese — the language of Cape Verde's former colonizer. Évora had a gift for elevating morna ballads, a style of song whose lyrics address poverty, longing, and most deeply, partings: of both the physical and emotional kind. Her melodic voice conjured the beauty and struggle, melancholy and yearning of life in Cape Verde. Performing without shoes, Évora was often paid with drinks and trivial tips as she performed for the sailors who arrived on the Portuguese cruise ships that docked at Mindelo. Yet her languid vocals and blasé glamour were unforgettable. She would eventually be known as the "barefoot diva" and the queen of morna, both names capturing the humble majesty she evoked. Decades before seasoned artists such as Sharon Jones and Charles Bradley reached world-wide fame at ages where most musicians had long retired or given up, Évora was "discovered" at the age of 47 by producer José Da Silva while singing in Lisbon. Bana, a Cape Verdean singer (known as the "king of morna") who had found success off the island, wanted to expose Évora, and morna, to a larger audience. So he invited Évora to perform in Portugal. That fateful trip would change her life. But as with much of her career, rightful acclaim would come later: four albums in, to be exact, with 1992's Miss Perfumado. That album made her an international star, and went on to sell 300,000 copies worldwide. But in 1995, Évora lit the torch brighter with Cesária, cementing her place as Cape Verde's morna master. Nominated for a 1996 Grammy for Best World Music Album, Cesária sees Évora's exquisite vocals paired with the opulence of guitars, percussion and violin. For the first time, her music was carried by a celebratory quality, suggesting that even in mournful morna some moments call for one to dance and sway in pleasure. On "D'Nhirim Reforma" the buoyancy in Évora's vocals lifts her beyond her renowned languidness. The rhythmic guitars on "Petit Pays" and "Nha Cancera Ka Tem Medida" captivate with their warmth, while the inclusion of the violin on "Areia de Salamansa" makes Évora sound as if she is performing in a European cafe. "Consedjo" and "Flor Na Paul" are communal songs sang with spirited backing singers whose inclusion strikingly contrasts with the lonesomeness Évora's vocals conjured on prior albums. And even when Évora is heard singing solo, the inspired whistles on "Rotcha 'Scribida" and "Doce Guerra" feel like sorrowful companions. The result is an album that is nostalgic yet saccharine free, one on which Évora's voice commands the music fully and is the vortex that all its beauty swirls around. By the end of Cesária, the definitive stamp that Évora had placed on morna was complete. By the mid-2000's, Évora was celebrated around the world — including a 2004 Grammy win for her ninth album, Voz d'Amor. But despite the acclaim, she was already beyond the notions and trappings of fame. She knew it was well-deserved and a long time coming. Rather than feel chosen like Cinderella placing her foot into the glass slipper, the barefoot diva remained unchanged. During one of her sold-out Montreal International Jazz Festival shows, which I attended towards the end of her career, Évora graced the stage with nonchalance, smoked throughout despite the non-smoking rule and addressed the audience at the end with a single goodbye. The intimate, spontaneous manner of her performance suggested that though the audiences had grown and the faces and places changed each night, she was still the woman performing in nondescript bars, singing timeless stories to drifting faces. She viewed fame as something that provided a greater vehicle to share her gifts with people around the world, which she did until her death in 2011. Évora's blues transcended the limitations of language, allowing her to blaze a one-woman path forward. And this groundwork she set has paved the way for others as diverse as the Buena Vista Social Club and Daymé Arocena. Today, artists in the genre of morna remain indebted to, and live in the shadow of, Cape Verde's chanteuse of blues.